20.04.2009 - Read what the players and coaches said after the semi-final success of Győr. 20.04.2009 - For the first time in the history of the club, Győr will play for the trophy. 17.04.2009 - The dangerous left winger hopes that Győr are mature for the task. 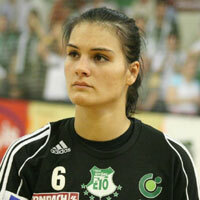 16.04.2009 - Daniela Piedade is confident before the Győr game. The Brazilian star believes in a victory.